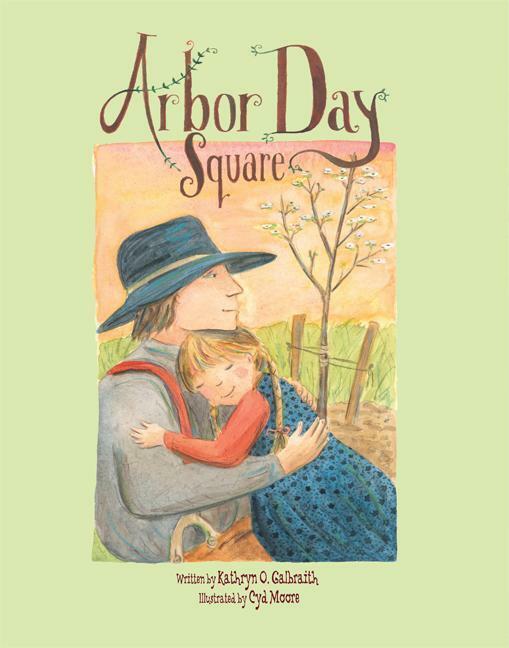 The World of Peachtree Publishers: Happy Arbor Day! Today is National Arbor Day! You could celebrate by taking a hike surrounded by beautiful trees, getting a group together to plant a bunch of trees in your neighborhood OR you could read our book: Arbor Day Square! Katie and her papa are among a group of settlers building a town in the middle of the dusty, brown prairie. Every week the trains bring more people and more lumber to build houses, fences, and barns. New buildings go up including a church with a steeple, a store with glass windows, even a schoolhouse with desks for all the children. But one thing is missing: Trees! When the townspeople take up a collection to order trees from back east, Katie adds her own pennies and Pap's silver dollar. When the tiny saplings finally arrive, Katie helps dig holes and fetch water. Then in a quiet corner of the public square, Katie and Papa plant a flowering dogwood in memory of Mama. This is a great book to teach your child the importance of helping the environment. There are so many ways to help, including planting your very own tree! Make sure to check out our recent post with some other of our favorite spring titles, here. Also, head on over to our new Pinterest page, including a board dedicated to celebrating Earth Day and Arbor Day! Don't forget to follow us while you're there and to re-pin so you can share your favorite Peachtree titles with your Pinterest followers. Happy Reading and be on the lookout for a new picture book from Kathryn Galbraith this Fall 2013!